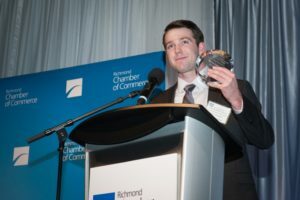 Novex is honoured to have received the Green Business of the Year Award at the Richmond Chamber of Commerce’s 39th Annual Business Excellence Awards. This award, a new nomination category this year, honours a business that demonstrates leadership with their environmental and sustainable business practices. 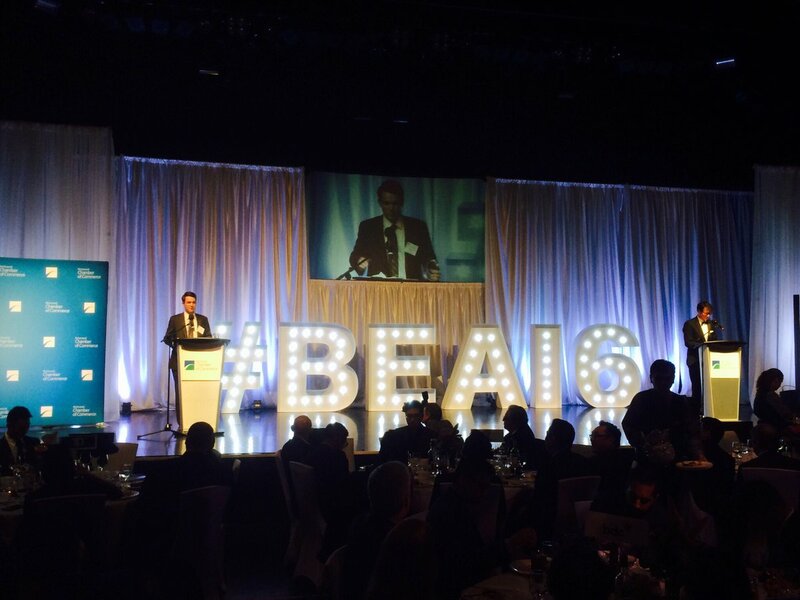 Brett Surgenor, Sales & Marketing Specialist at Novex, accepted the award on behalf of the Novex team. 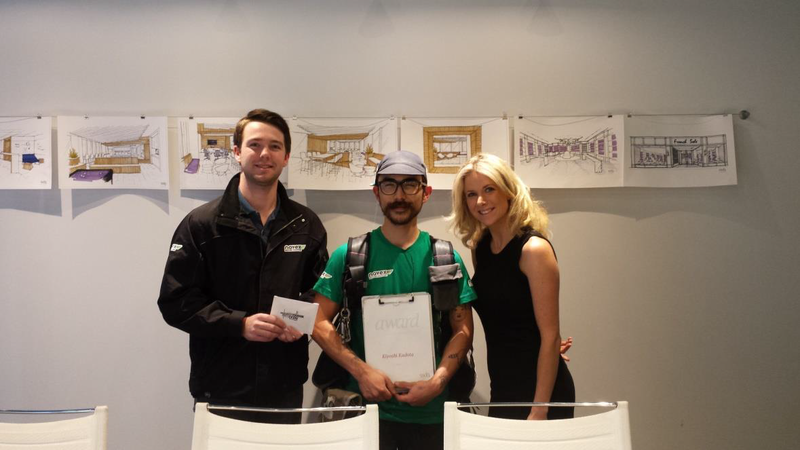 We would like to take the opportunity to recognize our bicycle courier Kiyoshi Kadota (pictured middle) for going above and beyond his daily routine at Novex. Kiyoshi was presented the “Customer Service Award” for the month of August by SSDG Interiors Inc. for his infectious positive attitude. Tonya Albers of SSDG Interiors (pictured right) praised Kiyoshi and all Novex couriers for being very patient and understanding, which she mentioned to be a difficult trait to find in a courier company. Kiyoshi’s impact has been overwhelming and appreciated throughout the entire organization – great work! 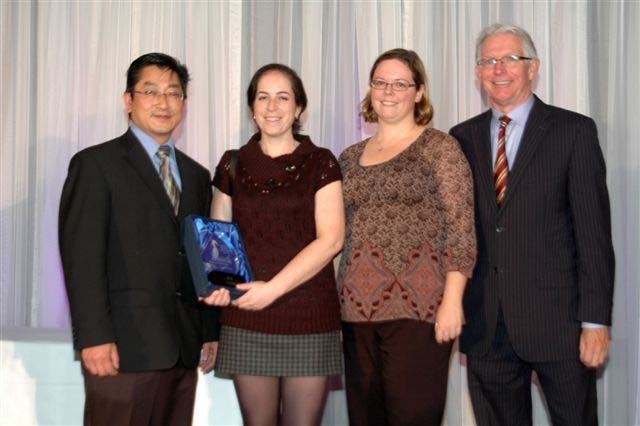 Novex Delivery Solutions was awarded the 2013 Transport Canada/SCL Green Supply Award. Novex was chosen for its outstanding contribution and commitment to reducing CO2 and NOx. Since its first Hybrid vehicle in 1993, the company has demonstrated continuous leadership in environmental practices. Novex is proud to be the winner of the 2010 Business Leadership Award. Congratulations to all the nominees. The Novex team would like to thank the Richmond Chamber of Commerce and all of our customers. The Caring for Ecosystems Award (from the Fraser Basin Council) honours stewards of the environment and natural resources, and recognizes initiatives that respect ecosystems and their interrelationships. Novex received the award for being the first local courier company in Canada to take steps to reduce its environmental impact, develop sustainable practices and recognize a triple bottom line. 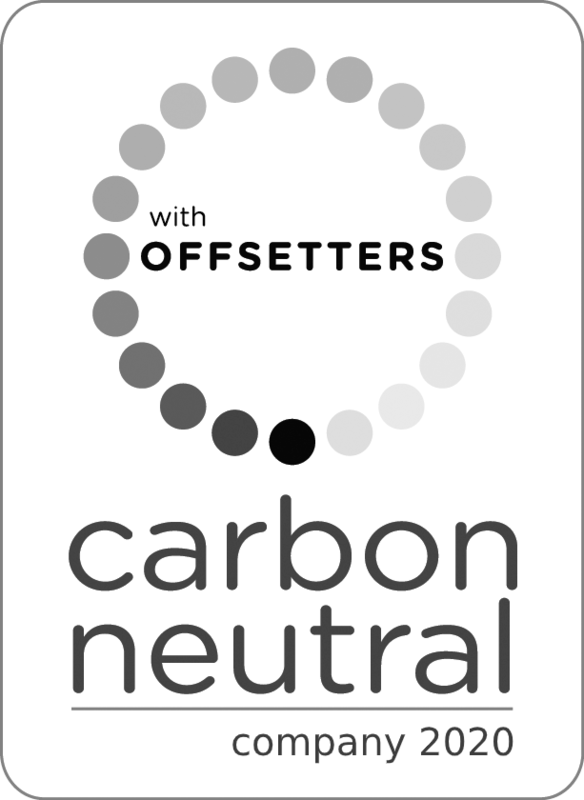 Novex has partnered with Offsetters to provide local carbon offsets, becoming the only carbon neutral courier in Canada. 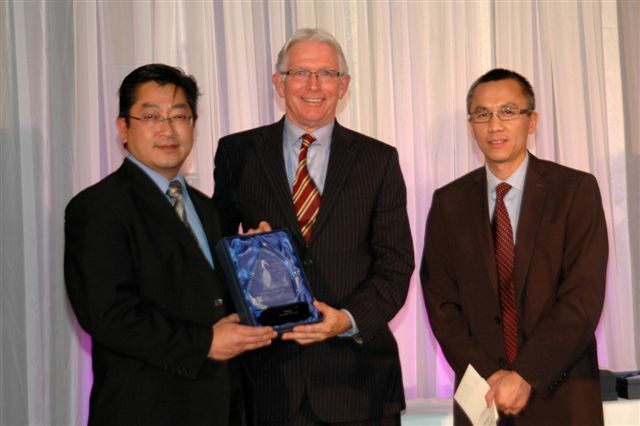 Novex Delivery Solutions received the ecoFREIGHT Transportation Award at Globe 2008. Knowing it was a major contributor to the growing environmental problem, the company has led the way in accepting that responsibility, committing to do the right thing and focusing on sustainability. Through a strategic plan, Novex has created a triple bottom line that includes a social, economic, and environmental focus. It’s the first courier of its kind to take its commitment to the earth, to their people, and to their communities.